Shaking Water Baths (also known as Reciprocating Water Baths), are designed to handle a wide variety of applications. These baths can be used effectively in molecular biology protocols (such as hybridization), bacterial culturing, as well as in solubility and metabolism studies. The SHEL LAB Models SWBR17 and SWBR27 Reciprocating Water Baths are designed to deliver precise temperature control and a smooth reciprocal shaking motion. 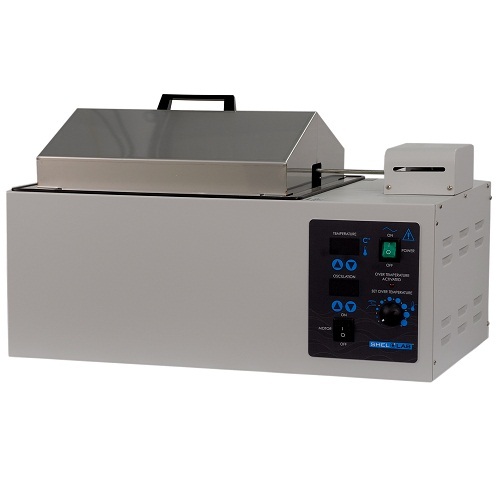 The oscillator control is independent, allowing the baths to also be used for regular constant temperature water bath applications such as thawing, warming reagents, or general incubation. Both the SWBR17, and SWBR27 Shaking Water Baths offer an adjustable stroke length ( 0.5″, 1″ or 1.5″), giving the user the ability to affect the degree of agitation. With a RPM range of 20-200, these versatile reciprocating water baths are sure to meet many application needs. Shaking Water Bath Applications Hybridization Applications, Cell Cultures, Cell Aeration, Increasing Solubility Rates, Molecular Biology Assays, Bacterial Cultures.